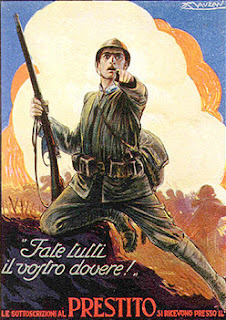 The Poster Obsesser: Achille Luciano Mauzan - Fate Tutti Il Vostro Dovere! Achille Luciano Mauzan - Fate Tutti Il Vostro Dovere! From 1915 to 1918 there was a continuous succession of war loans to be launched by newspapers, and even more, with posters. One of the most powerful posters of its kind, for realism and the dramatic charge of the image, it appeared just at the time around Kobarid: the figure of the maid with her index finger and – most ominously – toward the public seems to see the symbol of resistance on the Piave.